2019 is the year of national parliamentary elections in India. In 2018, several states will elect their legislative assemblies. Both the years will witness more noise than discussion, and more heat than light. Even research that might have been in the works and published this year or next will be viewed through tinted (or tainted) glasses. A recent paper by Pulak Ghosh of the Indian Institute of Management in Bengaluru and Soumya Kanti Ghosh, chief economic adviser of the State Bank of India, is an early victim of such a politicised interpretation. If one searched for their report, one gets a summary and a full report. The authors have been careful not to claim that their work is the most authoritative one on the state of job creation in India. Nor do they claim that they have come up with a model to estimate job creation in the entire Indian economy: formal, or informal and agricultural sectors. They are very clear that their work is about whether jobs are being created in the organised sector. Towards this end, they have looked at data from the Employees’ Provident Fund Organisation (EPFO), the Employees’ State Insurance Corporation (ESI) and the National Pension System (NPS). My initial reaction was one of scepticism. The first question that came to mind was the reconciliation between job creation and economic growth, and job creation and bank credit growth to industry. India’s gross domestic product (GDP) growth has slowed throughout the financial year 2016-17, and it appears to have bottomed out in the first quarter of 2017-18. In the quarter ending September 2017, there was a slight rebound in economic growth. However, bank credit to industry has not really picked up. Therefore, it would be reassuring if other evidence—direct or indirect—reinforces their estimate of formal job creation. I will now examine four issues—job creation by large listed companies, Reserve Bank of India (RBI) surveys of manufacturing companies, funding constraints for businesses and, finally, informal employment. First, India does not have a survey of business or commercial establishments as the US has. So, there is no payroll estimate available from employers. In October last year, Mahesh Nandurkar, the India strategist at CLSA India, wrote in Business Standard, “We looked at company annual reports of listed companies and nearly all listed companies give number of employees as at the end of the financial year. This is the most authentic and high frequency (once every year) data that one can get. Our analysis of more than 900 listed companies with a total employee base of 5 million shows that jobs growth has been good at 3.7% during FY17 and 4% in FY16. This is actually in line with the jobs growth seen for these companies over the last 10 years. 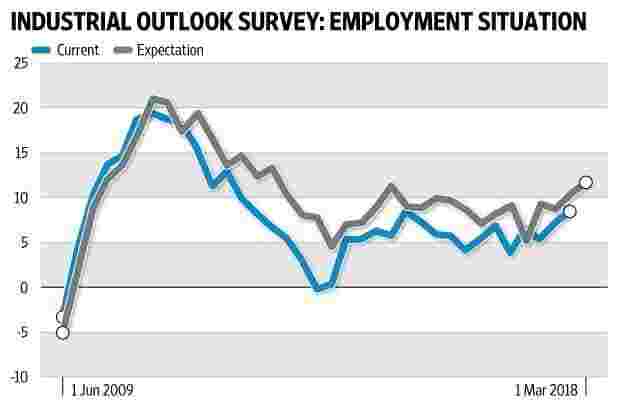 Thus, at least for this sample, the jobs creation has not slowed down over the last two years." As Nandurkar correctly points out later in the article, these are jobs created directly by India’s large listed companies on their payroll. India’s tax policy and tax system favour capital over labour, unfortunately. Yet, if their payroll growth has been around 4% in the last two full financial years, then it is quite likely that in the overall formal sector (including small but unlisted firms), job creation has witnessed a higher percentage growth. Yes, that would be still formal sector jobs, even if not necessarily better-paying corporate jobs. Even employees hired by contract labour firms (Teamlease for example) and placed in companies would be counted as formal jobs because EPFO, ESI contributions will have to be made for those workers. Ghosh and Ghosh do not claim that all the formal sector jobs that have been created have been created on the payrolls of the corporate sector. Indeed, they do want India to start measuring corporate payroll. Second, the Reserve Bank of India conducts several useful quarterly surveys. One of them is the Industrial Outlook survey which asks more than a thousand businesses (companies) in the manufacturing sector about various aspects of their business conditions from inventory to working capital to exports to imports and to employment conditions. Two charts are shown below. One goes as far back as the data permit. The other is from the time the National Democratic Alliance government came to office. 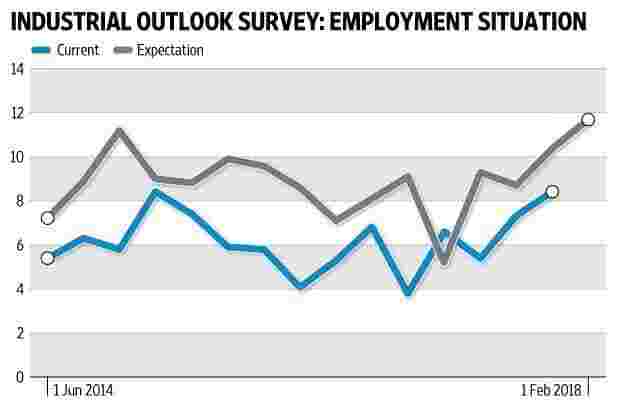 These are net positive responses (increase–decrease of jobs) on employment. The information content of the charts is high. Net hiring by manufacturing businesses fell precipitously from 2011 until 2013 (three years) almost reaching the lows seen in the aftermath of the global crisis of 2008. That is a reason to suspect the economic growth numbers that are now reported for that period. They are too rosy to be credible. The job situation was dire. That is another story for another occasion. That said, employment situation picked up in 2014 but did not take off until the second half of last year. The uncertainty caused by demonetisation is seen in the data and there was a dip in the second quarter of 2017 (April-June). In 2017, hiring intentions have taken off even more impressively than the present employment situation. So, the RBI survey does not negate the picture that Ghosh and Ghosh have painted. ■ “The Indian financial system is undergoing a gradual structural shift, with a greater role for non-bank intermediaries and higher recourse to market funding for large corporates. ■ The financial system is diversifying, with market shares of nonbank intermediaries (notably, mutual funds and nonbank financial companies—NBFCs) and private sector players increasing gradually—albeit from a low base. Banks’ share in credit flows fell from 50% during FY2015/16 to 38% in FY2016/17, as corporates increased private debt placements and issued commercial paper, replacing bank funding with market sources." Informal employment—do we know anything? Finally, what about informal employment? Timely data are not available. One must rely on surveys. Most surveys of informal employment done after demonetisation start with a pre-conceived conclusion and find responses that would validate them. The case in point is a rather interesting study on the response of the community in rural Tamil Nadu to demonetisation (Insights on Demonetisation from Rural Tamil Nadu—understanding social Networks and social protection—Economic and Political Weekly, 30 December, 2017). The authors mention that there was widespread support for demonetisation. Yet, they write in dire tones about its impact. They do not concede the possibility that they may be missing something given the “wide public opinion support" that they acknowledge twice in the report. Second, most non-agricultural jobs in India have no written contract (see Chapter 2, Economic Survey 2012-13). It is more likely the case for informal jobs. Therefore, it is rather difficult to know if, on balance, jobs were created or destroyed in the informal economy. Clearly, much needs to be done to create good quality jobs in India, from enabling job-seekers with the right and matching skills and attitudes, to lowering the cost of hiring labour, to making hiring workers desirable and to enable hiring in well-paying jobs. The first thing the government can do is to work on creating a better and timely jobs market data. Indeed, yours truly wrote that a useful mission for NITI Aayog will be to improve India’s economic data to first-world standards. America sets the standard even among developed countries. In this regard, what the Ghoshs have done is a very good starting point. Critics have to do better than to set up strawmen arguments and knock them down. V. Anantha Nageswaran is an independent consultant based in Singapore. Read his Mint columns here.